The educational event will be held at the Sun Coast Hotel, Las Vegas, Nevada June 20-21, 2019. Whether you’re an advocate, a person in recovery, a policy maker or an engaged community member, please join me and Lanie’s Hope as we support the Nevada Council on Problem Gambling for Problem Gambling Awareness: A Community Engaged. The Nevada Council on Problem Gambling never disappoints when it comes to offering great speakers, interesting programing and unique topics related to gambling addiction. This year is no exception! Topics at the 12th Annual Nevada State Conference on Problem Gambling include a focused presentation on “Gambling Addiction and the Drug Court Programs”, “My Journey from Convict to Conviction” by Maureen “Mo” Michael and Keynote Speaker Bo Bernhard, Ph.D., Executive Director of the UNLV International Gaming Institute. The registration fee is just $60! Professionals can earn up to 12 CEUs for continuing education. The programming is so valuable and informative that, anyone interesting in understanding current trends in understanding and treating gambling addiction should attend! Those in recovery from gambling addiction will benefit from the programs offered as will community healthcare providers, educators and treatment professionals. The registration fee is just $50! Professionals can earn up to 12 CEUs for continuing education. The programming is so valuable and informative that, anyone interesting in understanding current trends in understanding and treating gambling addiction should attend! Those in recovery from gambling addiction will benefit from the programs offered as will community healthcare providers, educators and treatment professionals. I have attended many National Conferences on Problem Gambling over the last 8 years – when I moved from “anonymity to advocacy.” This conference is rich in resources and the latest research on problem gambling – as well as treatment and advocacy information. I’m happy to report that the National Council on Problem Gambling has proactively encouraged involvement of the recovery community in their programming. This is so important, as the Recovery Community provides first hand knowledge that goes hand-in-hand with research and treatment. At the 2016 conference, the National Conference on Problem Gambling invited folks in recovery to serve as “Recovery Ambassadors.” Ambassadors were easily identified by special buttons provided for the event. Each morning there was an “open” Gamblers Anonymous meeting – for those in recovery and those who wanted to experience a meeting firsthand. 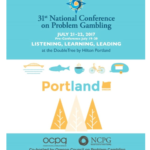 For this year’s event, the National Council on Problem Gambling requested presentations from the recovery community and will be offering at least 5 presentations from individuals in recovery. We applaud this new, focused initiative with special attention paid to the community the Council serves! The annual GASN Southern Nevada Mini-Convention will be held Saturday, March 25th, 2017 from 8:00AM to 5:00PM. This event is open to members of Gamblers Anonymous and Gam-Anon and anyone struggling with a gambling addiction. The price is $40 if registered by March 4th, $50 from March 5th – 19th. Registration closes March 19, 2017. Lanie’s Hope is not affiliated with Gamblers Anonymous. This information is provided for the benefit of our audience. Questions regarding this conference or any Gamblers Anonymous events should be directed to Gambler Anonymous of Southern Nevada at www.gasn.info or (702) 529-0202. Join hundreds of industry professionals at the fifth annual New Horizons in Responsible Gambling Conference. This conference has become a hub of thought leadership in the industry, and an unmatched platform for speakers and sponsors to make an impact. The 2017 conference will take place February 20 – 22, 2017 at the Vancouver Convention Centre in beautiful Vancouver, British Columbia. Situated on the waterfront near some of Vancouver’s most famous attractions and restaurants, the Convention Centre is adjacent to the Pan Pacific Hotel. This year’s conference will feature presentations from an impressive lineup of researchers, industry representatives, prevention specialists, and treatment specialists, who will discuss effective and innovative approaches to gambling and present strategies for healthy approaches and positive growth. For attendees, New Horizons in Responsible Gambling can inform and inspire, and present new solutions to age-old issues. For presenters and sponsors, the conference is an unmatched opportunity to make an impact on the future of the industry. Last year’s walk was dedicated to raising awareness of gambling addiction and suicide. I was honored and humbled to serve as the keynote speaker. I made a promise to myself and to my God to spend my life raising awareness of the social issues surrounding problem gambling. I would do ANYTHING within my power to prevent just one death due to a gambling related suicide. I believe that anyone reading this would too! So won’t you walk with us this year? Many of you know that I lost my sister Lanie due to a gambling-related overdose in June of 2008. See…I still can’t actually say the words “Lanie committed suicide because of her gambling addiction.” I always find myself couching this phrase in indirect ways like “a gambling-related overdose.” In my heart of hearts, do I think she intentionally killed herself. No. I think she was in such immense pain and shame that she simply didn’t want to FEEL anything. But we’ll never know, because Lanie’s not here to tell her story. What I do know is this. If Lanie had not been gambling, she would not have overdosed. If Lanie had continued to abstain from gambling and attend the recovery fellowship she belonged to, she would not have had to endure the shame and despair that drove her to overdose on antidepressants. Gambling Addiction DID cost my sister her life. …And…it cost me my best friend. It cost her daughter and son the loss of a mother whom they loved dearly. It cost her grandson Colby his “Grandma Lanie” whom he still speaks of with such love and longing, even though he was only 3 years old when she died. It cost her the opportunity to ever know her Granddaughter “Lyla Lanie” or her Great Granddaughter and Great Grandson who have come into our family since Lanie died. Lane died at the age of 52. She was a lung cancer survivor! She survived 9 years post chemotherapy, only to succumb to a disease that is so insidious that no one knew she was still struggling with the addiction. We, her family and loved ones, thought she was in recovery. We thought she hadn’t gambled in years. We were wrong. The disease of compulsive gambling is cloaked in secrecy and shame. The Suicide Prevention Coalition uses the term “Out of the Darkness” to describe their mission: taking suicide out of the darkness and into the light. The same philosophy must be applied to gambling addiction. When we illuminate the disease and raise awareness that gambling addiction (so often undetected as there are no tell-tail signs like slurred speech or a staggered walk) is a recognized mental health issue requiring treatment and therapy like any other addiction, we take it “out of the darkness.” This is my prayer, and this is the mission of Lanie’s Hope; to humanize and illuminate the disease of compulsive gambling. I invite each of you to walk with us on Saturday, September 1, 2016, as we take suicide and gambling addiction out of the darkness and into the light. To Register to Walk with Lanie’s Hope Team, Go to the “Merchandise” page, Select “Walk in Memory” and follow the prompts to register. There is no cost to register. Hosted by the Maryland Center of Excellence on Problem Gambling, this year’s theme is “Working Together for Problem Gambling Awareness.” Flyers are not yet available; however registration information should be available on line soon.